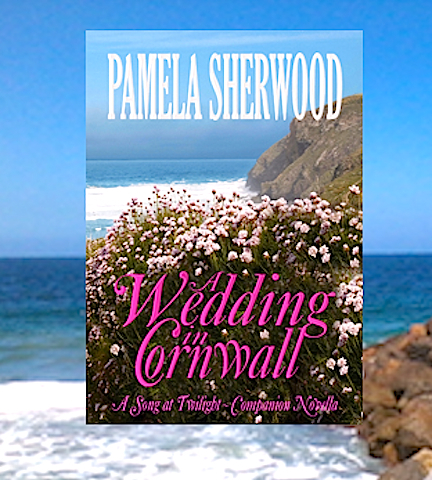 It’s Columbus Day–and the release date of my e-novella, A Wedding in Cornwall! The Story Behind the Story: To someone who loves words as much as I do and who tends to the naturally verbose <G>, writing shorter lengths tends to be a challenge. My short stories want to turn into novellas, my novellas into novels, and my novels into sagas! I admire and envy writers who can turn out those neat-but-complete packages of 20-40K words that can supplement their longer works or provide just the right amount of zing for the stressful holiday season, like a perfect amuse-bouche between dinner courses. But in this year of Trying New Things, I was determined to get the hang of it. For some time, I’d been toying with the idea of writing about Sophie and Robin’s wedding, though, at first, I wasn’t sure there was enough material for more than a very short story. Then another subplot idling at the back of my mind–concerning Sophie’s brother Harry and the woman he’d been carrying on with for the last few years–sprang to the forefront and attached itself to the wedding story, and suddenly I had a burgeoning novella on my hands. Even better, I had a solid narrative structure to follow from start to finish (this does not always happen, so cherish the times when it does!). A Wedding In Cornwall was completed in just a little under two months (that, too, was rare for me, and thus, worth celebrating). Serendipitously, I found a very pretty pre-made cover on BookGraphics.net that was a good fit for the story’s romantic spirit. L.K. Campbell, who formatted my fairy tale collection last spring, was available to perform the same service for A Wedding in Cornwall. So, within a fairly short time, the novella was ready to go, and I was mulling a mid-September release. At which point, my old computer gave up the ghost, necessitating a data transfer and a replacement/upgrade of my whole set-up. Fortunately, everything was recoverable, and I’m in the habit of sending my most important projects to my email cache anyway, so disaster was averted. Just. Have I mentioned lately that September is not my favorite month? This one was particularly trying. I hope you enjoy reading this tale as much as I enjoyed writing it!